Villa Cecilia is located at 50 mt from the sea, just outside the village of Trabia. The villa is close to the former buildings of the tuna fisheries that date back to the 16th century and to a little touristic port. The main house is enclosed by an ancient loquat garden known as "Big garden of Principi Lanza di Trabia". The Lanza family, which dates back to the 13th century, has been one of the most important and ancient aristocratic families of Sicily. During the 16th century, the Lanza gained title to the fiefdom of Trabia that became Princedom of Trabia in 1601. Their suggestive Castle built in the 10th century on sea rocks, is at only 200 mt of distance from Villa Cecilia. The Castle of Trabia has been elected as as preferred residence by Prince Raimondo Lanza di Trabia and has seen illustrious guests, like Susanna Agnelli, the writer Giuseppe Tomasi di Lampedusa, the shipping magnate Aristotle Onassis, to name a few. 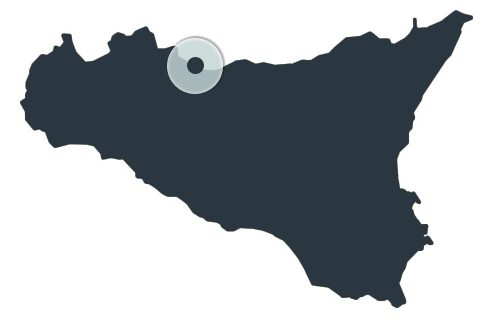 Is a village situated on the coast, 34 km east of Palermo, along sea route 113 towards Cefalù and Messina and conveniently located at 2 km from the highway access. The lovely village was created between the 10th and 11th centuries from a nucleus of houses surrounding the Castle, between the hills and the sea, green olive trees gardens, fertile plantations of strawberries, peaches, loquat and citruses. It is now a renowned Tyrrhenian Sea touristic centre, with its beaches, the Castle on the sea, the sea chapel Santa Rosalia, the green hills, its restaurants, with its small fishery village of San Nicola l'Arena with its own castle on a well-known touristic port. Trabia is described in the first historical document that mentions the production of pasta. Video: "The origins of pasta". “To the west of Termini there is a town called Trabia ('At Tarbiah, the square), an enchanting place to live, abounding in streams that drive numerous mills. Trabia sits in a vast plain with many great estates, where great quantities of pasta (in arab - itriya - spaghetti) are made and exported everywhere, especially to Calabria and other Muslim and Christian lands; many shiploads are sent. In the port of this town they catch that big fish which is called tuna”. With this historical testimony it is then confirmed that the dry long pasta called "itriya" (spaghetti) used to be produced, even before 1154, in the laborious town of Trabia were they were they carried out handicraft, commercial and marittime activities.